Newly installed turbines at the Salkhit Mountain wind farm, 70 kilometres from Ulan Bator, June 4, 2013. 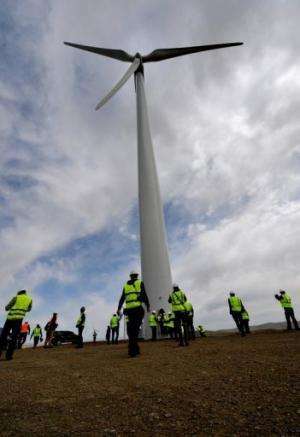 Mongolia on Thursday opened its first wind farm, a landmark $122 million project that aims to shift the country's reliance on coal and tackle the pollution choking its capital Ulan Bator. Mongolia on Thursday opened its first wind farm, a landmark $122 million project that aims to shift the country's reliance on coal and tackle the pollution choking its capital Ulan Bator. A total of 31 turbines have been erected at the facility, which are expected to power five percent of electricity needs in a country undergoing rapid transformation on the back of a spectacular boom in mining—particularly coal. Backers hope the 50-megawatt facility erected 70 kilometres (43 miles) south-east of Ulan Bator at a windy ridge called Salkhit will be the first step in a national drive to harness cleaner energy in the mineral-rich country. 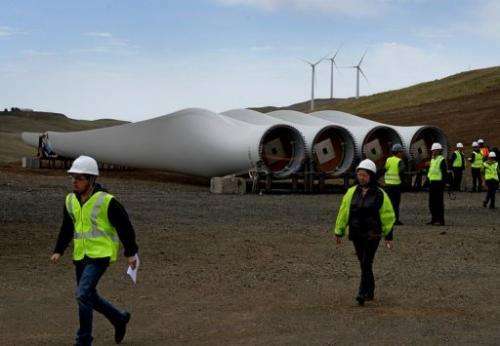 "Salkhit represents the first private sector-initiated project in what is still a highly-regulated, inexperienced-in-private-investments market," said Boldbaatar Tserenpuntsag, from Mongolian investment firm Newcom, which is backing the wind farm. "This positive experience will pave the way for future investments in the energy and other vital infrastructure sectors and acts as a concrete demonstration of the government's green development agenda." Fifteen of the wind turbines were switched on at Thursday's opening ceremony, with the remainder to become operational next month. A newly installed turbine at the Salkhit Mountain wind farm, 70 kilometres from Ulan Bator, June 4, 2013. Backers of the plan hope to extend Mongolia's wind capacity by 20 times, transforming the country of three million people into one of Asia's renewable energy centres. The Mongolian capital was ranked the planet's second-most polluted city by the World Health Organization in a 2011 report, largely due to its coal-fired power stations and residents burning coal to keep warm in winter, when temperatures can plummet to a punishing minus 30 degrees Celsius (minus 22 Fahrenheit). The new wind farm—which will supply 140-170 million kilowatt/hours of power each year to the national grid—will reduce demand for coal by 122,000 tonnes a year, helping the government meet a target for renewable resources to make up 20 percent of the country's energy needs. Eighty percent of energy requirements currently come from coal in Mongolia, where more than $1 trillion worth of untapped resources are underground. 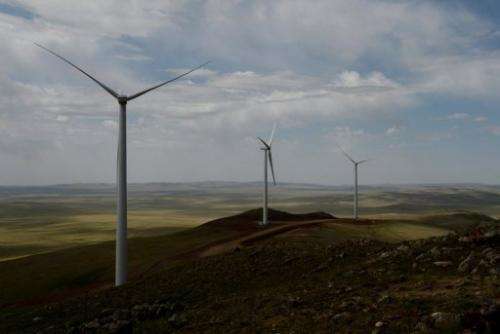 Backers of the plan hope to extend Mongolia's wind capacity by 20 times, transforming the country of three million people into one of Asia's renewable energy centres. Ulan Bator's one million residents will be among the first to benefit from the new energy source, backers claim. The blades of a soon-to-be-installed turbine at the Salkhit Mountain wind farm, 70 kilometres from Ulan Bator, June 4, 2013. A total of 31 turbines have been erected at the facility, which are expected to power five percent of electricity needs in the country. During the winter, dense, grey clouds of smog often linger for days in the city, which lies in a narrow valley, and pollution is six to seven times higher than even the most lenient WHO standards. The city's three coal-fired power plants are one of the main causes. Also, residents of the poor outlying "ger" districts—named for the nomads' tents used for housing—burn coal, tyres and rubbish as a heat source in the harsh winter. The area's population has ballooned in recent years, as more nomads arrive in Ulan Bator to seek a share of Mongolia's new-found wealth based on natural resources. The organisation ranks the Iranian city of Ahvaz as the world's most polluted city in terms of airborne particles.